Okay so we may have made up the term “super beauty food,” but when we started reading about the amazing ways that carrots can improve your complexion, we got a little excited. When we think about foods that will make us more beautiful, our minds often turn to rare and exotic plants that have marketing hype and mystique surrounding them. But those ingredients often travel long distances to get to us, meaning more resources spent and nutrients lost as they spend more time out of the ground or are processed. So we’d like to highlight an amazing beauty food that is anything but exotic — carrots. You might enjoy them dipped in ranch, atop a simple salad, or had them packed in your lunches as a child. It’s one of the top 10 consumed vegetables in the US, so we’d wager you’re more than familiar with this sweet root. But did you know that eating more carrots can seriously supplement your beauty routine? 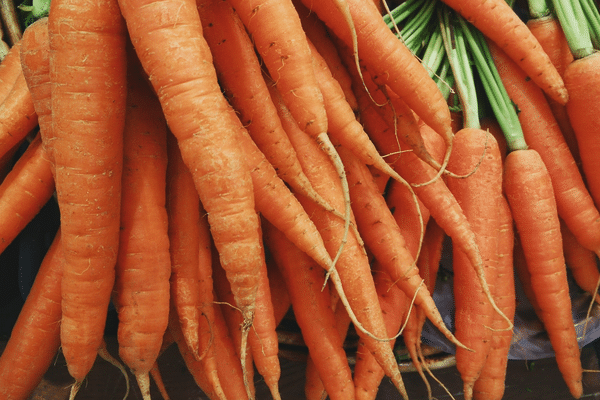 Here are 3 reasons that eating more carrots can give your more beautiful skin. You probably already know that the beloved orange carrot is great for your health. Low in calories and sodium, it’s high in vitamins and antioxidants thought to protect from environmental stressors. But would you be surprised to learn that carrots are also great for your skin and complexion? Here’s why you may want to add a few more to your salads and soups this spring as you get ready for your spring look. You know how your hands get a little orange from handling carrots? Consume a few more than you usually would and you could enjoy a natural healthy glow this spring. Your body turns beta-carotene—the main carotenoid in orange carrots—into vitamin A in the body. A small carrot supplies nearly 300 percent of your daily intake of vitamin A (4,142 micrograms of beta-carotene), so one carrot a day could take you a long way toward that healthy glow you’re going for this spring. Can you eat a carrot and reduce the appearance a wrinkle? It's not quite that simple, but add more carrots to your daily diet and you may increase the skin’s health. One cup of carrot juice straight or in your smoothie will give you about 22 mg of beta-carotene, as well as a good dose of vitamin C, which also could help the skin appear more firm and plump. Carrots for oily skin? It’s worth a try. The key again is the beta-carotene, which is converted to vitamin A in the body. Vitamin A, in various forms like retinoids and tretinoin, is already included in many topical oily skin products. But you can naturally boost the skin’s vitamin A content by eating the carrots, as well. For years, dermatologists denied that there was any connection between oily skin and diet, but now we’re beginning to learn more. Recent studies have found that certain foods, like dairy products and high-glycemic items, can, indeed, set the stage for more oily skin. On the other hand, some studies have found that eating a low-glycemic diet improved oily skin, and that cutting back on dairy could do the same. Could including more healthy foods like carrots also help clean up the skin? Shred and chop them into your salads and soups. Add chopped carrots to your favorite rice pilaf mix. Add shredded carrots into your potato salad. Toss shredded carrots with Greek yogurt, lemon juice, garlic and parsley, and use as a topping for grilled meats. Add them to your muffin recipe. Put them into your smoothies. Shred them onto your burritos and quesadillas. Slice and marinate on fish dishes. Enjoy some homemade carrot cake. Do you love carrots? Please share any tips you have for adding them into our daily diets! The easiest way I’ve found to get the micro nutrients from carrots is to juice them. It’s very tasty if you just sit with half a green apple three carrots and a very little bit of fresh ginger. This post is written in a very good manner and it includes many useful information for me. I would definitely try what you just suggested me. thanks! Such an informative post! thank you for sharing such an important post. I really did not know these benefits of carrots. I have an oily skin and it really irritates me sometimes, I would definitely try what you just suggested. thanks! I eat a lot of carrots. Are there any negative effects of eating took my? Love carrots! I mostly just eat them whole right out of the fridge. I have also heard that they are helpful balancing hormones, especially with the skin on. I eat at least one every day.